Inaugural Blessing at the Lummi Nation near Bellingham, 2665 Kwina Road. LUMMI NATION — The cornerstone of northwest Native American art, the totem pole, served as both inspiration and rallying point this morning as over 250 residents of Whatcom and Skagit Counties, both tribal and non-tribal, gathered at the Lummi Nation to launch the totem pole journey. 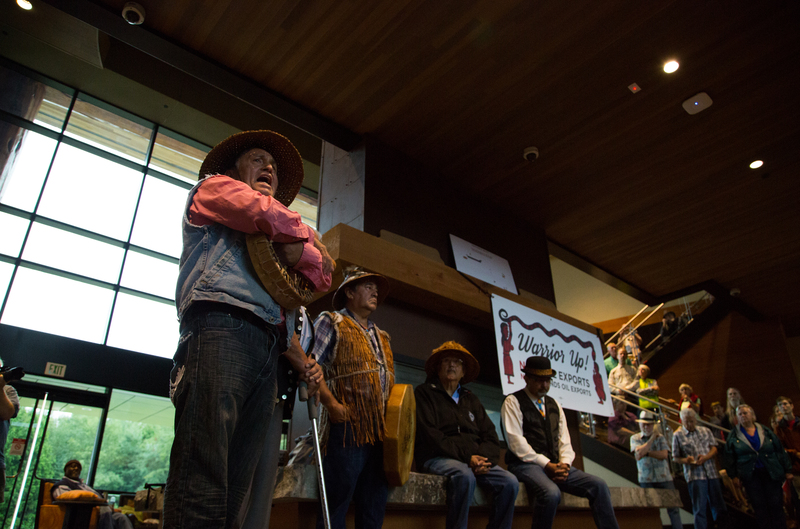 The focus of the event was the announcement by six major Christian churches in the Pacific Northwest that they would join the fight to block North America’s largest coal terminal at Xwe’chi’eXen, the Lummi name for Cherry Point. Rev. Charis Weathers of Echoes, an experimental congregation of the Evangelical Lutheran Church in America, leads in a blessing of the totem pole. Rev. Weathers presented a statement of support to Master Carver Jewell James on behalf of her Christian denomination. Photo by Paul Anderson. Master Carver Jewell James addresses the crowd and speaks powerfully to the reasons behind the journey. His remarks touched on the disappearing lifeways of the Lummi and other indigenous peoples, and the moral obligation to honor our shared responsibility to the land and water. Photo by James Leder. Hereditary Chief Tsilixw presents the historical and cultural case for a shared responsibility, and offers his blessing for the journey. Photo by James Leder. Those in attendance also heard from Chief Tsilixw, hereditary leader of the Lummi tribe, who spoke to what he felt was the responsibility of people of all faiths to uphold a shared responsibility to the land and water, and to future generations. Other speakers included Jay Julius, a Lummi Councilmember and fisherman, Swil Kanim, a Lummi tribal member and performing artist, and Doug James, a Lummi tribal elder and member of the House of Tears Carvers. Pledges of continued support were offered by representatives of local environmental organizations: Matt Petryni, Clean Energy Program Manager for RE Sources for Sustainable Communities, and Stephanie Buffum, Executive Director of Friends of the San Juans. Following the remarks of speakers, members of the crowd were invited to join in blessing the 19-foot red cedar totem pole, which ultimately will be presented to First Nations battling tar sands proposals in their homelands of northern Alberta. 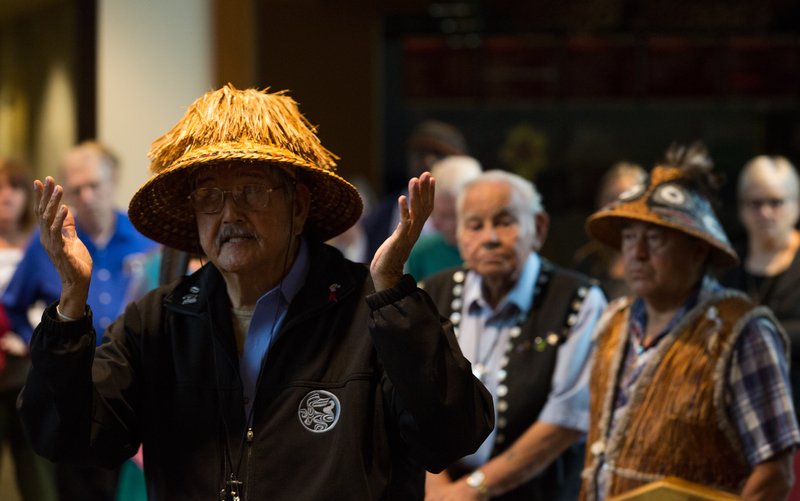 The journey brings together an unusual alliance of First Nations, environmental organizations, and faith communities in a combined effort to protect the sacred sites of the Lummi Nation and the communities of the Pacific Northwest. The journey was launched this morning at the ceremony and will take approximately three weeks to complete, with the final ceremony scheduled for September 6 in Alberta. Please click here to support this important journey.